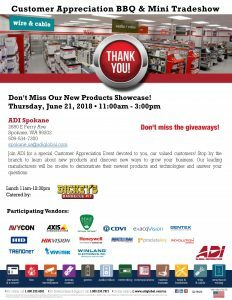 Events - Winland Electronics, Inc.
Visit us at the ADI BBQ in Spokane, WA . Christina Elliot will be there representing Winland at the event. Are you headed to ESX Expo this month? Stop by booth #130 and talk to Michael and Brian. Ask them to show you how you can increase your RMR! Winland will be exhibiting at the ADI expo in Lisbon. Stop by and visit with Fabio! If you are in Madrid this week on June 6th, stop by the ADI expo in Madrid! Fabio will be there representing Winland. 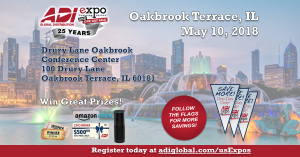 Stop by and visit us at the ADI Expo in Chicago tomorrow Thursday May 10th, being held at the Drury Lane Theater in Oakbrook Terrace. Winland will be exhibiting from 12:00 Noon – 6:00 PM. Stop by and talk to Michael, Patrick and Frank. Ask them about our INSIGHT solution and our new Wireless WaterBug. Hope to see you there! Winland will be exhibiting at NJESA (New Jersey Electronic Security Association) this week on March 15th from 5:30 to 8:30pm. The event is being held at Harrahs Resort in Atlantic City. Stop by and talk to Joe about our INSIGHT solution, and ask him to show you our new Wireless WaterBug! 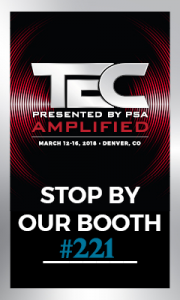 Join us in Denver, CO on March 14th, 2018 at PSA TEC! We will be demonstrating our INSIGHT solution in booth #221, during the one day only exhibit hall from 10am – 4pm. Michael and Adam will be on-hand to show you how we can help your business monitor your assets! Join Winland at CEDIA 2017! Are you looking to expand into new markets? Then visit Winland in the Security Solutions Pavilion at Booth#6145. Ask us about our INSIGHT solution, and how it can remotely monitor your home and business environmental conditions. Winland is excited to be attending the 1st annual KYESA Trade Show next week on Thursday August 24th, at the Hilton Garden Inn Airport in Louisville KY. Stop by our booth (B7) and ask how Winland’s INSIGHT solution can remotely alert your customers to pending critical conditions. See you there! Join us this week at the annual RBC being held on July 27th-29th in San Antonio, Texas at the Henry B Gonzalez Convention Center. Stop by our booth #1324 and lets talk about how we can help you monitor your pharmacy’s medications using our INSIGHT solution. INSIGHT offers offsite temperature monitoring and cloud-based reporting . Once you review our solution you can go to our website www.winland.com, and request a product demo to explore our comprehensive, cloud-based alerting, reporting, and logging further. Look forward to meeting you there!